384 pages | 40 B/W Illus. This facsimile edition of Bennett and Pinion's classic work, first published in 1935, provides an invaluable source of information on all aspects of the slating and tiling industry. 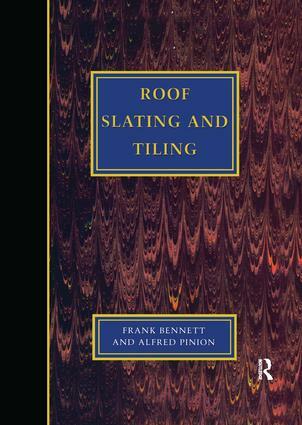 It examines the various types of roof coverings that were traditionally used, such as slates, clay tiles and shingles, and includes basic aspects such as sorting and holding states, through to more complex aspects involved in sorting and setting out a diminishing course roof, and forming swept and laced valleys. The book also looks at special roofing techniques relating to curved roofs and cupolas. It considers the care of roofs, discussing the faults which can appear, and why they may have occurred, and then how best to repair them.